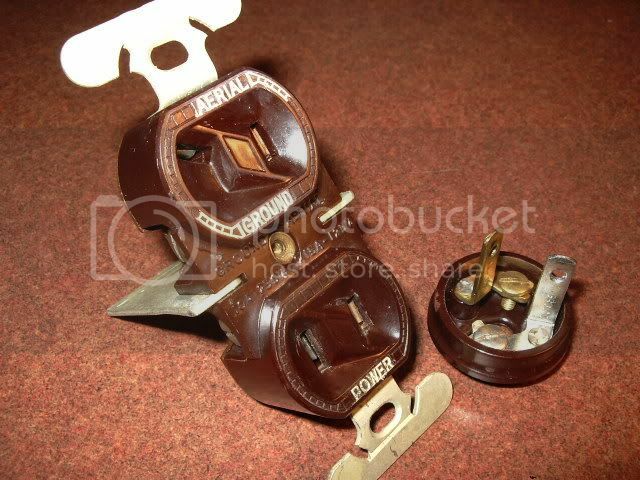 Antique Radio Forums • View topic - Can anyone ID this vintage power plug? Can anyone ID this vintage power plug? Post subject: Can anyone ID this vintage power plug? I found this old plug attached to a very rotten old power cord that someone had connected to the antenna terminals of a 1930 RCA console. I don't recall ever seeing a plug with the blades oriented the way these are. So, does anyone have any idea what this plug may have been used on and what era it's from? Whatever it is, I just hope that someone didn't plug it in a live outlet while it was attached to the antenna terminals of the radio in which I found it connected. Post subject: Re: Can anyone ID this vintage power plug? That's a common antenna-ground plug from that era, which has absolutely nothing to do with a power cord. Unfortunately the idea didn't work out so well. Many homes had antenna wires installed up in the attic, and there were special outlets installed in the wall that connected to the antenna and ground. That was the matching plug and yes, many unskilled people took pliers and "straightened" the "bent" prongs so they could plug the "cord" into the power outlet. You can imagine what happened, and that is part of the reason why many old radios from the 30's and earlier are found with antenna coils burned to a crisp. In the neighborhood where I grew up in the city, many of the homes built before WW2 had those antenna outlets in the living room or den. Typically the homes there were built between 1920 and 1940. I suspect those homes which did not have the attic antennas installed during construction were fitted with them by the owners, to avoid having to use an outdoor antenna for radio reception. Thanks for the information. In that case, I might re-attach it to the radio. I wonder how hard it would be to find the correct wall outlet for this type plug? Seems to me that within the past several months I saw some advertised for sale, either here in the ARF classifieds or perhaps on eBay. I see them every now and again in boxes full of old wall sockets and light switches at estate sales. Found this unused pair at a flea market a few years ago. The really scary part is that they chose to combine this into a duplex receptacle where the other half was 120 volts AC. Today that would never pass UL, but even then it was a very dangerous idea. I would expect that during or after the 1950's when TV took over, most of those wall outlets were removed and replaced with regular duplex outlets. If I ever found one of these outlets, I'd either hang on to it for historical reasons or use it strictly as an antenna connector. I have one of those outlets, too. My has patent #1829648, 1857079 on the back side. Dates it in the early 30's.